This my Escher-esque cover for Allen Forkum's auto industry monthly, "Automotive Report". We decided on a surreal approach once we recognized the main article didn't have it's own visual hook. Ahhhhh...nicely done. And the return of the taped paper! Thanks for the good word. You can imagine how it was dang near impossible coming up with a lively illustration based on DRY DRY DRY shop tips (one was how to collect and use extra spray paint that clings to the inside of the containers...JACKPOT!). Once Allen was open to a non-literal approach, I just kind of let my mind wander. And rendering masking tape is illustration GOLD. 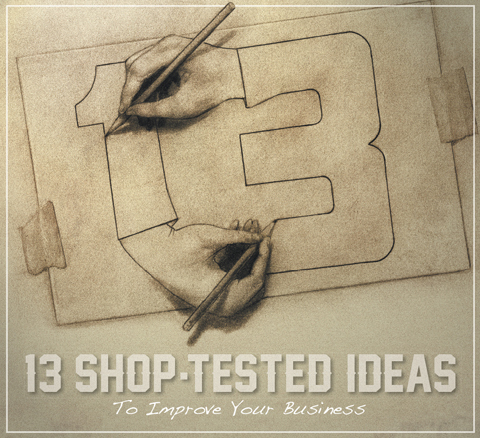 Good thing there weren't 14 shop tips, don't know how you'd do a Esch-er- sketch using 14! That "Esch-er Sketch" was awful. So bad it was great!!! Like a wise man once said, "To Escher own." This page contains a single entry from the blog posted on May 4, 2013 12:11 AM. The next post in this blog is Non-Fiction Book Cover Illustration Idea.